Numerous industry reports have concluded that small apartment properties have generally suffered less price devaluation than other income-producing property types during the recession. 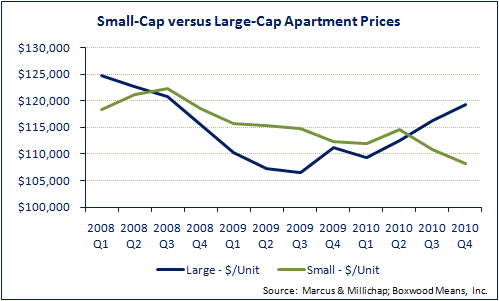 And according to data that investment brokerage Marcus & Millichap compiled for SmallBalance.com, prices for small-cap multifamily properties held up better than mid-sized and larger multifamily complexes as well. That finding resonates with commercial property price trends as a whole, where Boxwood Means’ Small Cap Price Index has to date outperformed the Moody’s/REAL CPPI that generally tracks larger assets. That said, as the adjacent graph illustrates apartment properties trading at $5 million or more have of late garnered higher prices than their smaller-property counterparts. The recent trend notwithstanding, most prognostications point to a reasonably lucrative 2011 for most small-cap apartment investors – and larger multifamily players too. During the heart of the recession properties that sold for $1 million to $5 million traded at a higher average price per unit than $5 million-plus communities over 10 straight quarters: from the third quarter of 2008 through second quarter 2010. However, the positions have reversed over the last two quarters. In fact, larger properties are now appreciating in value at a strong clip while small-cap properties are struggling to rebound. The average price per unit for the $5 million-plus properties rose for three consecutive quarters: from $109,250 during last year’s first quarter to $119,250 in the fourth. Meanwhile average per-unit prices of smaller properties fell during the third and fourth quarters (to $110,750 and $108,250, respectively) after remaining generally flat during the previous six quarters. Capitalization rates were lower for the small-cap property group for much of the darkest days as well, typically by 20 to 30 basis points from Q208 through 3Q09. But since then, the larger properties have attracted more aggressive bidding: with $5 million-plus deals trading on average at 10 basis points tighter than small-cap transactions. The spread widened during 2010’s fourth quarter, with larger sales averaging a 6.9 percent cap compared to a 7.2 cap for the $5 million-and-under deals. Perhaps predictably, the overall dollar sales volume of $5 million-plus assets fell more dramatically than small-caps during the depth of the slow-down. Quarterly volume remained in the $1.1 billion to $1.7 billion range for smaller properties from the fourth quarter of 2008 through last year’s third quarter. Meanwhile larger sales fell from nearly $10.0 billion during Q308 to just $1.8 billion a year later. But here again, trades of larger properties have rebounded with more gusto as investor appetite for investment-grade CRE assets has ticked up: i.e., hitting $9.0 billion during this past third quarter and $7.2 billion during the fourth. Small-cap trades bounced a bit to $1.5 billion during the second quarter, but closed 2010 out with the slowest quarter in quite some time at just $900 million. The research and communications staffs at Marcus and Millichap assembled these numbers for SmallBalance.com utilizing the brokerage’s internal figures along with data from Real Capital Analytics and other firms. The figures don’t factor in sub-$1 million deals. Smaller properties historically tend to perform better than heavy-amenity communities during periods of weak resident demand, notes Craig McConachie, president and principal broker of C&R Real Estate Services, a large property manager and brokerage in Portland, Ore. Without having to fund ongoing costs of swimming pools, rec centers and other amenities typically featured with larger properties, small-cap landlords are more able to offer competitive rents and still generate decent cash flows, McConachie elaborates. Still, as apartment owners and managers know all too well, consumer credit risk generally remains well above pre-recession levels. But on a more encouraging note, that risk has fallen for three consecutive quarters, according to Chicago-based multi-national credit research firm TransUnion, which provides resident credit screening services to apartment managers. And based on TransUnion’s recent survey of nearly 500 property managers that oversee 50 or fewer apartments, conditions are clearly improving for small-cap landlords. Seven in 10 respondents indicated their properties are completely full, up from six in 10 a year earlier. Three of every four responded that average rental rates have been stable or improved over the last year. And the proportion of respondents concerned about securing credit-worthy tenants fell from three in four a year earlier, to two in three in the latest TransUnion survey.